Is it possible to generate financial returns at the same time as investing to support positive environmental and social outcomes? Amanda Young will explore impact investing, and how the UN Sustainable Development Goals help measure impact. 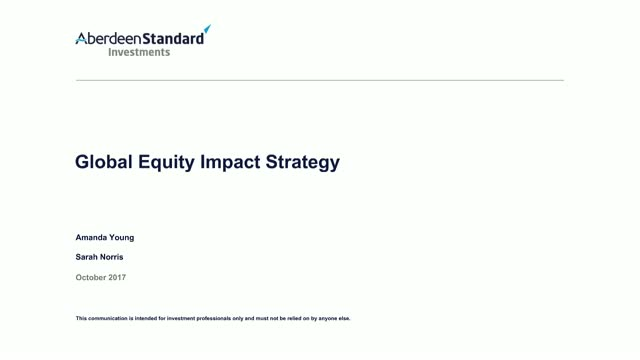 Sarah Norris, Portfolio Manager of the Global Equity Impact Fund will give a brief overview of the proposition. Bambos Hambi discussed the updates, changes to fund and outlook fort he next quarter. An update on the SLI UK Equity Unconstrained Fund with our fund manager Wes McCoy and Theo Craig. Looking at the performance of the fund, an overview and the outlook for the next quarter. Please join us to hear an update from Sean Flanagan, Senior Investments Manager, and Scott Kay, Senior Investment Specialist, covering key themes within the portfolio and a summary of current positions and outlook. There will be an opportunity to submit questions during the webcast. Fund manager, Mark Munro, discusses the changes, updates and outlook for the Total Return Credit Fund. There will be opportunity to ask questions during this webcast. Please join us to hear an update from Fund Manager Neil Richardson covering key themes within the portfolio and a summary of our current positions and outlook. For international dial in details please look in attachments. What is behavioural finance? What behaviours prevent us from making the right investment choices? How can we improve our investment decision making? The study of behavioural economics allows us to better understand the decisions we make. We show how behavioural finance can lead to better investment decision making. We explore the inherent biases we must overcome to achieve our long-term investment goals. And we provide five tips to achieving better investment decision making. Digging deeper, we look at ‘noise’, the random variables that effect our decisions. And we provide lessons from three books that changed the way we think about thinking. Join us as we discuss the potential impact the Brexit decision could have on the UK equities market from a small, medium and larger companies perspective. Our Senior Political Economist, Stephanie Kelly will be giving an insight from a macro position, and joining her will be Andrew Millington, Head of UK Equities, fund manager Thomas Moore and fund manager Wes McCoy from our UK equities team. Roger Webb, Deputy Head of Sterling Investment Grade & Aggregate, will be providing an update on the Aberdeen Strategic Bond Fund, as part of our Fixed Income Capabilities suite. He will be giving an overview of the activities within the fund and provide an outlook for the remaining quarter. There will be opportunity to ask questions during this webinar. Amanda Young, Head of Global ESG Research will be interviewed by George Guest. They will talk through our recent brochure on the Standard Life Investments (SLI) Ethical Funds - providing an overview of 2018, covering the engagement, voting and activities of the SLI Ethical Funds Advisory Group. She will also be providing an outlook for the remainder of 2019. Today's world offers unprecedented choice for investors, Across public and private markets, geographies and sectors, there are countless ways to meet your investment goals. At ASI we aim to connect this world of opportunity to deliver the best solutions for our clients. We are delighted to invite you to join our forthcoming webcast at which our Head of Global Strategy, Andrew Milligan, will discuss our latest macro-economic and market views whilst considering the Outlook for the next quarter. There will be an opportunity to pose your questions directly to Andrew at the end of his presentation. What impact could you have on our planet in a year? Could you stop C02 emissions equivalent to millions of cars? Could you provide safe drinking water for nearly 16 million people? That's what can happen when you invest in companies that can prove a measurable positive impact on contributing to our society and environment. Katie Trowsdale, Fund Manager, provides an update on the MyFolio Range. The MyFolio Funds are carefully constructed risk-based portfolios which offer your clients a choice of active and passive investment strategies across five risk levels. Please join us to hear an update from Mike Brooks, Head of Diversified Assets, and Scott Kay, Senior Investment Specialist, covering key themes within the portfolio and a summary of current positions and outlook. Please join us to hear an update from Fund Manager Neil Richardson and Global Asset Specialist William Martinez covering key themes within the portfolio and a summary of our current positions and outlook. Review and outlook for emerging markets. Bambos Hambi, Head of Multi-Manager Strategies, provides an update on the MyFolio Range. The MyFolio Funds are carefully constructed risk-based portfolios which offer your clients a choice of active and passive investment strategies across five risk levels.